NEW and HOT!!! The Black Knights are here! I also have a Custom UK version! Prices and availability are in the shopping pages!The Reissues are updated! Click on the pics below for reissue of your choice! The link will take you to a full review with pictures and price info! 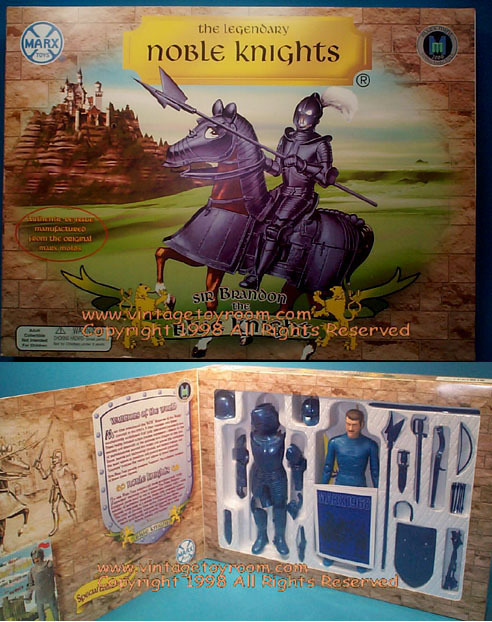 Both the stock reissue Black Knight and the VTR Exclusive custom are in! 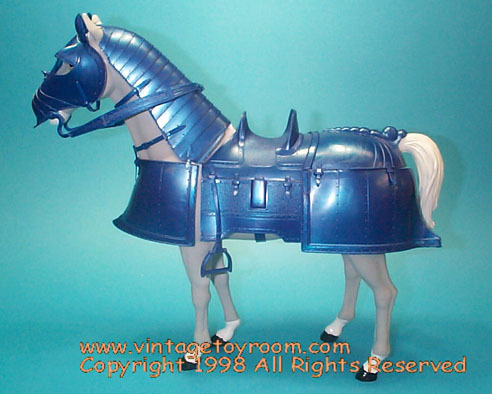 The Vintage Toy Room is proud to be involved with the designing of the Blue Knights!We are also equally proud of our color variations of the Vikings! They look great! Click on any of the images to see a LARGER picture, and in most cases as more detailed imaged of content! To order: First Email or call 585-227-9533 confirm I still have them in stock!! SEE FORSALE LIST! Prices include free shipping!! Need More? Click here to see BOTW reissues!! Picture(s) to the left and right show the stock version of the Cedric figure boxed, photo to the right shows the custom UK version w/ Indian flesh!! 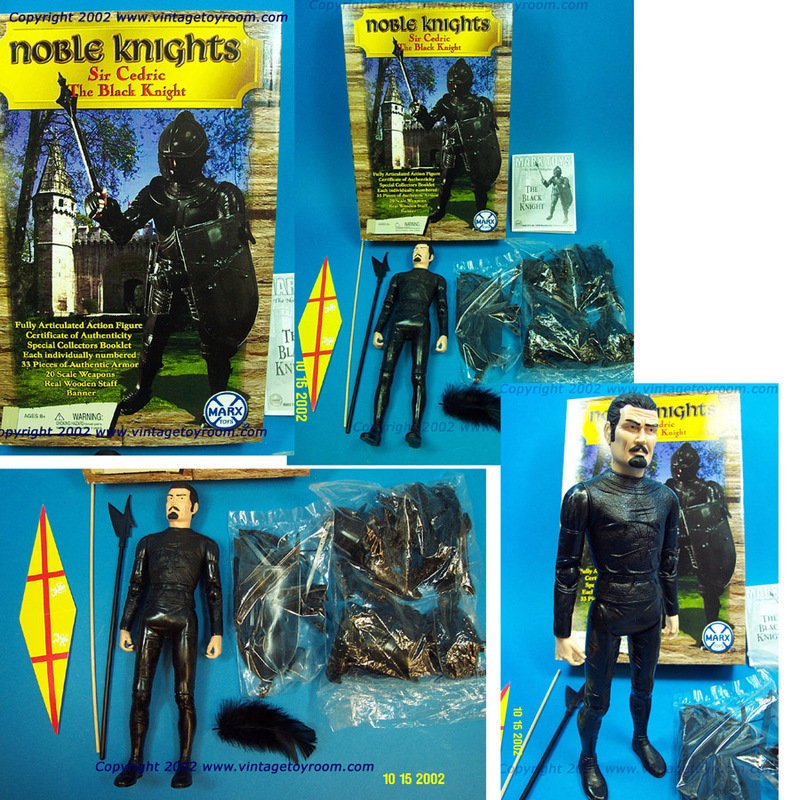 !Click on the pics below see the new Custom Made Black Knight! indian Flesh, Swansea instrux, yellow feather, paper flag w/ stained staff! 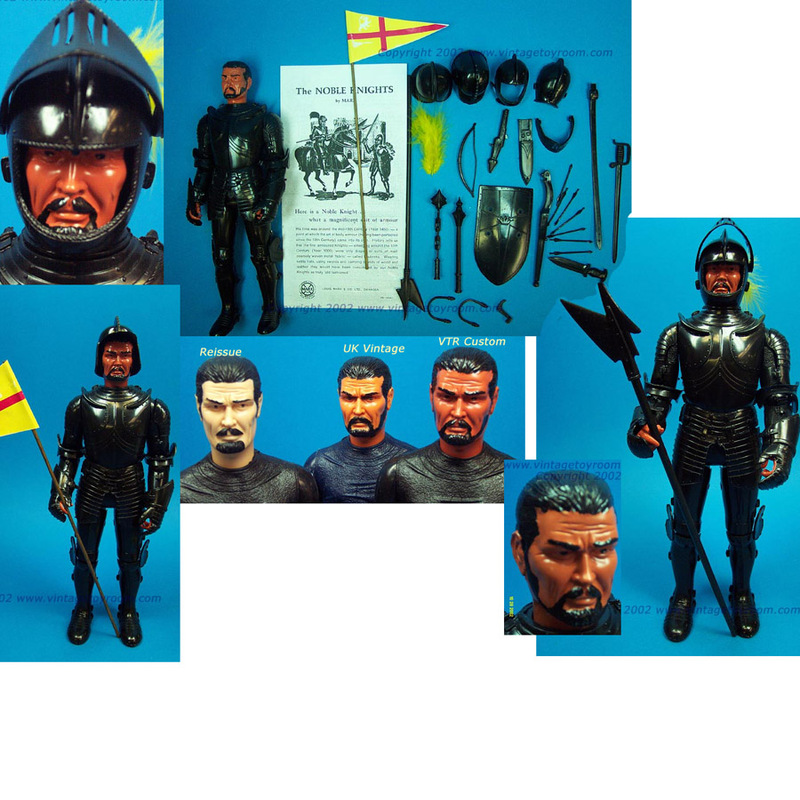 The figures are molded in black vs the dark purple UK Swansea produced vintage versions. I still feel it is lighter, more hard plastic like. The poly accessories are Black, harder. Broken tabs are still an issue. The custom version I did still had a few tabs that broke. Be careful during assembly! Accessories are sealed in bags for the most part. The flag is cardboard not paper like vintage. The Pole is not stained like vintage. The feather is black not yellow like vintage, lastly NO INDIAN flesh! Vintage had both, Indian red being most sought after. The Vintage toyroom has a custom version see pics! See the forsale list for pricing! 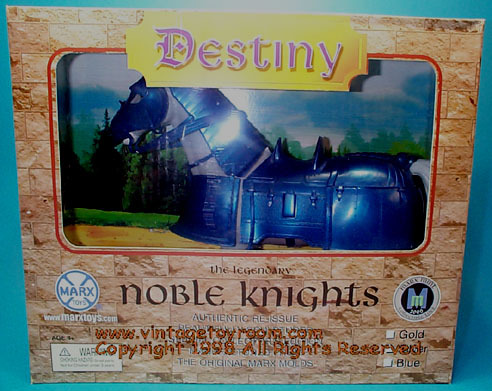 Sir Brandon The Blue knight W/ Destiny! 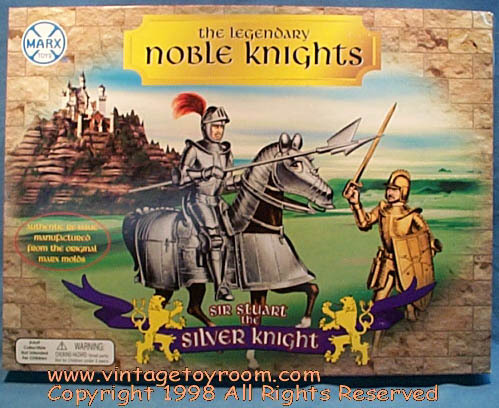 The Blue Knights are probably the best "new" color variation produced in the post 1999 production run. The color was derived from truck paint! Can you believe it? I was approached by Marx Toys for ideas for new colors. To avoid issues with communication, I hand painted armor in dark Blue Metallic Dodge Dakota Truck Paint, and sent it to them. I was really intent on have a dark blue metallic,(even a bit darker than production). The result is very close. A great color combo, added to the fact we picked a different head, Sheriff Garrett. Think what we could do with Marx mold swapping, and colors??? VTR had NOTHING to do with names, (Destiny, nor Sir Brandon), hold the calls on that one. The other options pondered were Dark Red metallic and perhaps a White Knight. Sir Stuart and Sir Gordon Review! The figures are molded just like the vintage in size, and color. The armor is a very close color match as well. Reissue color is right on! The exact same number of accessories are included with the reissues. Click here to see Gordon, Click here for Stuart. The Bodies feel similar to the vintage, the weights are 10.5oz vintage vs 10.25 oz new, a wash in weight, I would say they are alike in weight. Price Is exceptional! The Armor is worth it alone! Obviously knights are attainable to people now more than ever. The first difference I will hit on is the hardware! 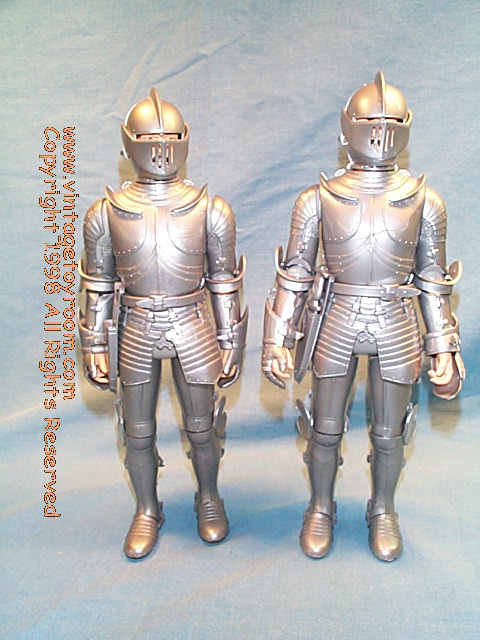 The Rivets stick out on the shoulders, and a little on the hips. The Mexi Vikings have the rivets countersunk in, so why the miss on these? They were made in the same plant. A second hardware difference is the arm springs are used on the legs. Vintage uses a bigger spring on the legs. See Pics. Hair Paint is another difference. Reissues have flat paint, painted by hand, not airbrushed with stencils like the vintage. See the Stuart and Gordon head Pics. Armor may look the same, but it seems a little more fragile. Some tabs were damaged, and break rather easily, so be careful! 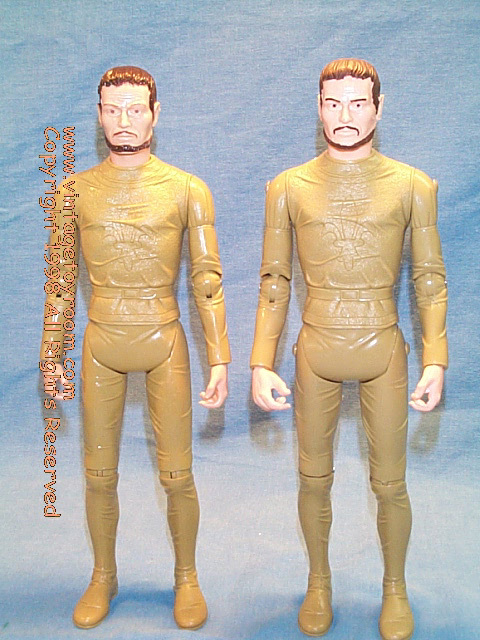 The shoulders are broke most of the time on vintage figures, the same applies to the reissues. I would have liked to see the armor sealed in bags on the trees! Then collectors could put it on only once, more carefully(and break the tabs themselves). Now the box. The box is too big, a pain to ship, and is not strong enough. I think we all agree to keep it to the Playing Mantis, or Dragon packaging style and design. The attempt was nice, but a miss by collectors p.o.v. The Flag Banner is cardboard, not paper like vintage. Odin The Viking Chieftain and Erik the Viking Son! 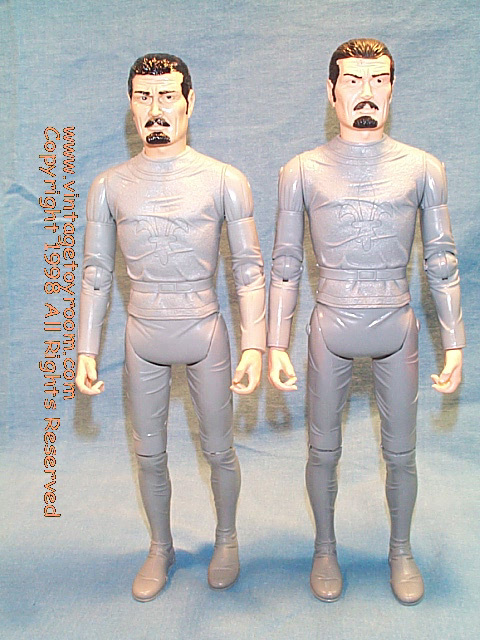 The figures are molded in Maroon and White unlike the vintage. Same in size, and color. I still feel it is lighter, more hard plastic like. The poly accessories are silver or gold. 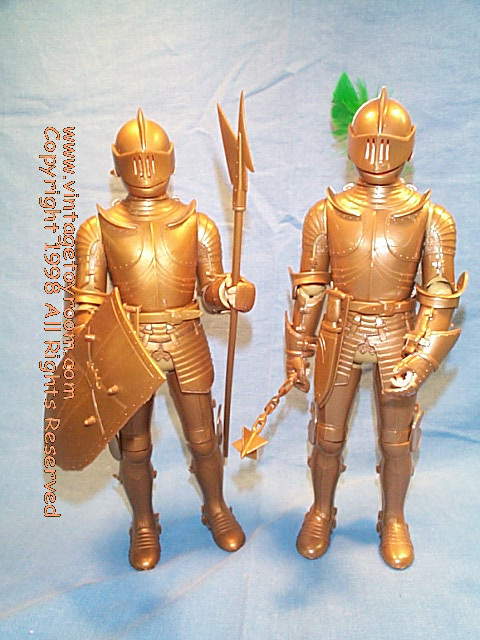 Despite how they were packaged, the intent was to have GOLD poly for Odin and Silver for Erik. The colors were switched after production, a small gliche...The VTR submitted these orig color concepts, so all of our products will be sold in that manner in which it was intended. Maroon/white/gold for Odin, and White/black/silver for erik accs. The vinyl accessories are nicely manufactured, both Eriks black, and Odin's white. NOW...Points on reissues. We were lucky on the knights and vikings! all molds were complete! I hear the black knight is coming, though a few things like body color is different. It will not be Indian flesh color either so I am told. They sound nice just the same, what a bargain they will be! Trademarks used on this site are the property of their respective owners, and are offered for product identification purposes only. 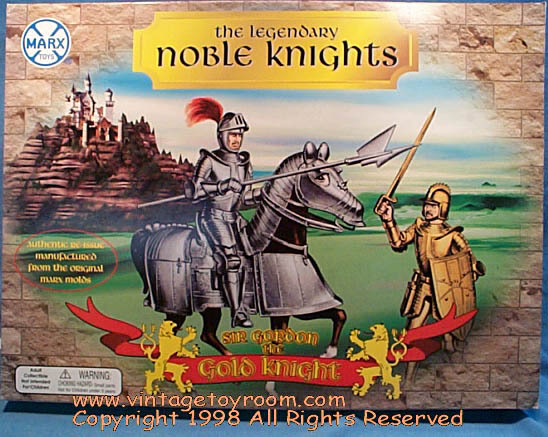 The Vintage Toy Room is not directly affiliated with Marx Toys or any company whose products are discussed or displayed on this site.